Over the weekend, thousands of spectators followed the 47th Prix de Lausanne Finals at the Beaulieu Theater in Switzerland — both in person and online through the live streaming. From the 21 Finalists, eight were awarded a scholarship allowing them to enter one of the partner schools or companies of the Prix de Lausanne. At the top of the prize winners’ list is 16-year-old American dancer Mackenzie Brown, who studies at the Monaco-based Académie Princesse Grace, was the 2016-17 Miss World Dance and is a Russian Pointe ambassador. Brown delighted the panel of nine judges, which included Gillian Murphy and Carlos Acosta, and went on to also receive the Contemporary Dance Prize and the Audience Favorite Prize. Watch her classical variation here and her contemporary variation here. This was her second year being a part of the Prix, as last year she participated in the inaugural Partner Schools Choreographic Project. In addition to Brown, the other 2019 Prize Winners are: Gabriel Figueredo, a Só Dança Ambassador from Brazil; Sumina Sasaki, a Japanese dancer who won this year’s Best Swiss Candidate Prize as she studies at the Tanz Akademie Zürich; Yu Wakizuka, from the same Japanese city, Osaka, as Sasaki; Shuailun Wu, a student at The Secondary Dance School of Beijing Dance Academy; João Vitor Da Silva, a promising 15-year-old from Brazil; Alexandre Joaquim, a dancer from Portugal who has competed and taken part in the Prix for multiple years; and Mio Sumiyama, a Japanese ballerina who won the top prize at the International Dance Competition in Spoleto, Italy last year. 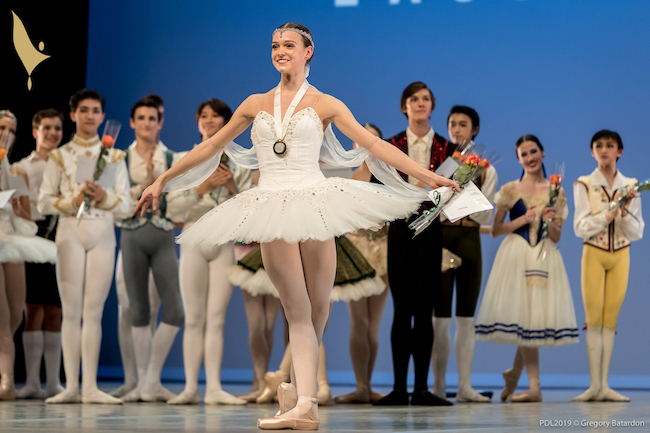 Furthermore, American finalist Julia Shugart was awarded the Best Young Talent Prize from the Nureyev Foundation. At 16 years old, Shugart is widely known in the states as a ballet competition circuit regular. She trains at the All American Classical Ballet School in Tampa, FL. In total, 74 out of the 81 initially selected Prix candidates participated in the 2019 competition week. This year’s competitors were watched by an unprecedented number of viewers — reportedly 562,530 fans tuned in to watch the daily sessions. The selections supposedly had more than 1,199,322 views. For more information on the Prix, visit www.prixdelausanne.org. Photo: Prix de Lausanne 2019 Prize Winner Mackenzie Brown. Photo by Gregory Batardon.